University of Georgia Press, 9780820351179, 160pp. 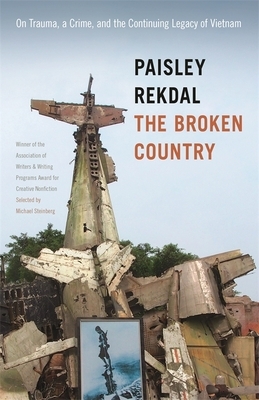 The Broken Country uses a violent incident that took place in Salt Lake City, Utah, in 2012 as a springboard for examining the long-term cultural and psychological effects of the Vietnam War. To make sense of the shocking and baffling incident--in which a young homeless man born in Vietnam stabbed a number of white men purportedly in retribution for the war--Paisley Rekdal draws on a remarkable range of material and fashions it into a compelling account of the dislocations suffered by the Vietnamese and also by American-born veterans over the past decades. She interweaves a narrative about the crime with information collected in interviews, historical examination of the arrival of Vietnamese immigrants in the 1970s, a critique of portrayals of Vietnam in American popular culture, and discussions of the psychological consequences of trauma. This work allows us to better understand transgenerational and cultural trauma and advances our still complicated struggle to comprehend the war. PAISLEY REKDAL is the Poet Laureate of Utah and a professor of English at the University of Utah. She has been honored with a National Endowment for the Arts Fellowship, a Pushcart Prize, and a Fulbright Fellowship to South Korea. Her work has been published in numerous anthologies, including Legitimate Dangers and the Pushcart Prize Anthology.